Priority for the discovery of the element with atomic number 112 has been assigned, in accordance with the agreed criteria, to Gesellschaft für Schwerionenforschung (GSI) (Center for Heavy Ion Research) in Darmstadt, Germany. The discovery evidence was recently reviewed and recognized by a IUPAC/IUPAP joint working party. IUPAC confirmed the recognition of the element in a letter to the head of the discovering team, Sigurd Hofmann. The IUPAC/IUPAP Joint Working Party (JWP) on the priority of claims to the discovery of new elements has reviewed the relevant literature pertaining to several claims. 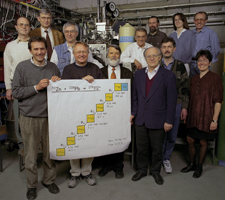 In accordance with the criteria for the discovery of elements previously established by the 1992 IUPAC/IUPAP Transfermium Working Group, and reiterated by the 1999 and 2003 IUPAC/IUPAP JWPs, it was determined that the 1996 and 2002 claims by Hofmann et al. research collaborations for the discovery of the element with atomic number 112 at GSI share in the fulfillment of those criteria. A synopsis of the relevant experiments and related efforts is presented in a technical report published online in Pure and Applied Chemistry on 25 May 2009. The new element is approximately 277 times heavier than hydrogen, making it the heaviest element in the periodic table. With the priority for this discovery established, the laboratory at Darmstadt will be invited to propose a name for the super-heavy element. The suggested name will then go through a review process before adoption by the IUPAC Council. Page last modified 1 July 2009.